Take advantage of your family stay at Mercure Marne La Vallée to visit Disneyland® Paris located only 5 minutes from the hotel. Opposite the Bussy Saint Georges RER train station and close to the A4 and A104 highways, you will be within easy reach of central Paris. Orly and Roissy Charles de Gaulle airports are less than 30 minutes away. 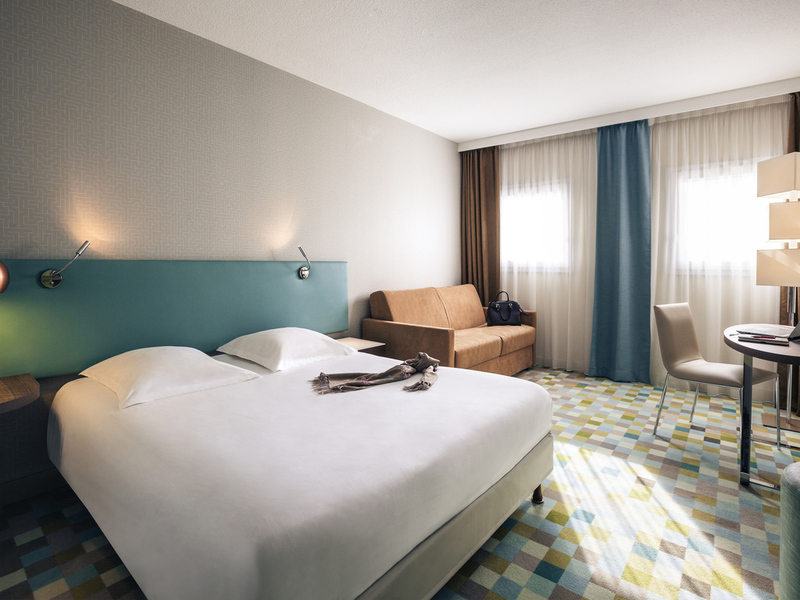 The Mercure Marne La Vallée Bussy St Georges hotel is the ideal place to stay! The staff is always very welcoming and putting up with my broken french and more than willing to switch to english. I have stayed twice at this hotel. In both stays the staff were friendly and the breakfast was fine. On the 2nd stay there were several problems with the bathroom. 1. The bath plug did not open once it had been closed. I travel with my sone who has learning difficulties. After I gave him a bath I could not empty the bath water so I could not have a bath or shower. 2. The sink plug would not close so I could not fill the sink with water. 3. The soap dispenser did not work and would not dispense any soap. I pointed out these issues to reception and suggested that a partial refund would be appropriate but I have heard nothing from them. Nice hotel perfectly located to go to Disneyland or Val d'Europe (By RER). The place is nice, clean. The room is well laid out. Tasty breakfast as usual. Rooms need some attention. The sink was blocked and was reported on 2nd report someone came to fix it, judging by the amount of hair and stuff down there it had been there a while, so obviously housekeeping weren’t doing a good job communicating the problem to their supervisor. The bin was not emptied and beds poorly made up. On the last day they had the cheek to knock on the door to do housekeeping. Don’t bother letting them do a preauthorised amount on your card as there is no minibar. I signed up for quick check out and this is a requirement, so don’t sign up for a quick check out as they take the cash and then ask for payment again, then when you prove they have the cash they blame the automatic program run by another company, lol. Anyhow, the hotel is in an excellent location to visit Disneyland, a very short walk to the train station and less than 10 minutes to get there, 5euro return cost. Hotel has a very nice, hot and cold breakfast and a nice little area for under 4’s to play in the cafe/bar area. The staff we met were all very nice. The tv needs more English channels or a pay for film service, or a tv in the kiddy area with cartoons and films at least for the youngsters. Room was clean and comfortable. Great choice for our weekend! The good point: staff was kind and service-oriented; and overall cleanness was good. However, our room was not ready when we arrived at 2:00 PM, even though checking-in time is at 12:00 PM. Were given a substitute room for guests with disability. Elevator broke for significant time. Refrigerator was not working. Experience with AC was poor: noisy and not cooling enough. The staff was not accommodating at all when I asked if my son's food could be heated up. I was told to purchase something on the menu. I request Accor and am a gold member, I have never experienced this before. I did order food for 2 adults, you should be ashamed it was for a child. Also my son was eating breakfast and did not finish as I was leaving with the small amount that was not finished I was told to order room service, very rude. Stay was comfortable. Check in was quick, staff was cooperative. Location was best in terms of accessibility to train station, super market and restaurants. We faced problem as elevator was out of order for a day. Room stains on carpet. Furnishings worn. Certain Reception not overly friendly when requested a breakdown if my bill. Very disappointing to find on arrival that the AC was not working. We had chosen a hotel specifically with this given the hot summer. All the more annoying that we were not informed in advance. It had broken the day before so we should have been told so we could rebook elsewhere. V difficult to sleep as a result. Great. Perfect location for Disneyland Paris and Paris. All staff were very helpful and friendly before and during our stay. Room was very comfortable and breakfast was great. Nice stay, quiet area and close to Disneyland Paris. We have stayed at this hotel for a number of years. Two nights to see our friends in Noisy-le-Grande and the staff are always excellent. It is in good location but need to improve on the breakfast which has hardly anything for vegetarians apart from bread and butter.